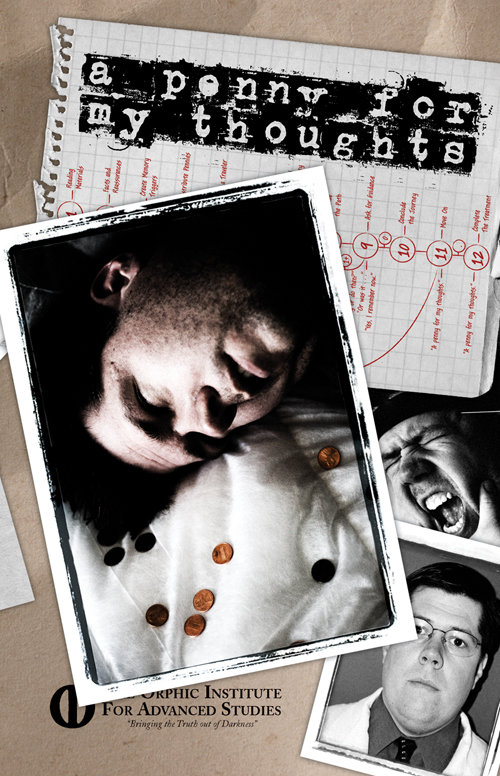 A Penny For My Thoughts is a short storytelling game about trauma and lost memory. The premise is that the three players are all victims of some disastrous experience that caused them to lose their memories. Thanks to a special mind-enhancing drug, they are able to access fragments of those past events — both their own and one another’s. To begin, each player writes down on a card three visceral experiences or sense impressions: in ours, these were things like “the smell of rotting lemons” or “vertigo.” Then the players take turns rebuilding past memories for their characters. Each draws a card from the shuffled stack and says, for instance, “I remember the smell of rotting lemons.” The other two players take turns asking establishing questions, such as “Were the lemons from a lemonade stand?” and the player who is doing the recollection must — in good improv style — reply, “yes, and…”, accepting the offer and providing an additional detail of his or her own. Instead, when the protagonist reaches a point of decision, the other two players each describe something they sense the protagonist did next. The remembering player then selects one of those options and narrates the outcome, proceeding to the end of the scene. In that respect, the game is a little like a tabletop CYOA, in that someone else is supplying the options at critical points. Each player “remembers” three scenes over the course of play: one good memory, one bad memory, and one memory that explains the trauma leading to the amnesia. The result is a play experience that is as intense as any I’ve yet run into in the storygame field, producing an unusually tight and coherent narrative, but allowing the player relatively little control at certain key points over what kind of person the protagonist will be. After all, it doesn’t matter what vision you have for your character: if you think he’s a James-Bond-style man of action, but the other two players insist on giving him choices like hiding and running away, you can’t really break out of that box. Sure, you can try to signal a character concept to the other players via descriptions and hints, but you’re not really in full control, especially during the scene-setting stage. The structure produces a fairly tight narrative. There isn’t really time to introduce very many supporting characters, and you always know that the story arc is bending towards explaining how everything went wrong for your protagonist. And while you can’t determine what your protagonist does, you do control what everyone else does in each scene you narrate. I found that made it easy to pick up threads from previous scenes, reincorporate previously seen characters in the ways I wanted to, and raise the stakes on my character. Some people might not like the theme or the uncertainty about who the protagonist is. I found it scary, but in a good way. “A Penny for My Thoughts” is set in the real world; aside from the therapy procedure being used to recapture memory, there’s no magic or science fictional element, and the grounding premise tells you that everyone involved has had something pretty horrible happen. So the stories tend not to be epic adventures of saving the world, but smaller-scale, personal narratives about screwed up family relationships, broken careers, love affairs gone awry. Another source of intensity is the nature of the roleplaying itself. Because players are recounting events that have happened to their characters in the past, there’s a certain amount of leisure to get into a flow, to build up a continuity that I don’t always feel when roleplaying a more conventional scene. There’s also a lot of room to explore the protagonist’s inner life — motives, thoughts, reactions. Player monologues can become fairly nuanced and emotionally fraught, and as a listener, you have an experience that is not so much different from listening to someone confiding about a terrible past experience that really happened. So there’s an unusual quality of pseudo-intimacy about it, even when you’re playing with people you barely know. Then, too, the rapidfire improvisation means (or at least, meant for me) that a number of my ideas wound up drawing on things that have actually happened to me — in a disguised or twisted fashion, admittedly. So some of the scariness comes from feeling that you’re not quite completely in control of a situation that might wind up heading into some deep emotional waters. There are ways to mitigate this: the Seattle storygames group plays with the cardinal rule that you’re always allowed to “draw the veil” over any aspect of the story that is hitting home too hard and that you’d like to remove from play. In practice I never came close to using it in “Penny”, but the sensation of not knowing exactly where things would go or whether I would even wind up liking my protagonist was a potent one. Overall, I found “Penny” taut and satisfying, and a good workout for one’s storytelling skills in general. But it’s not a light or cheery game, and it deserves to be played in a quiet, safe place without a lot of distractions. This entry was posted in CYOA, plot and narrative structure, tabletop games by Emily Short. Bookmark the permalink.